These are all continuation patterns so are best used in the direction of the trend. This triangle has a flat trend line on the top and a rising trend line from below. 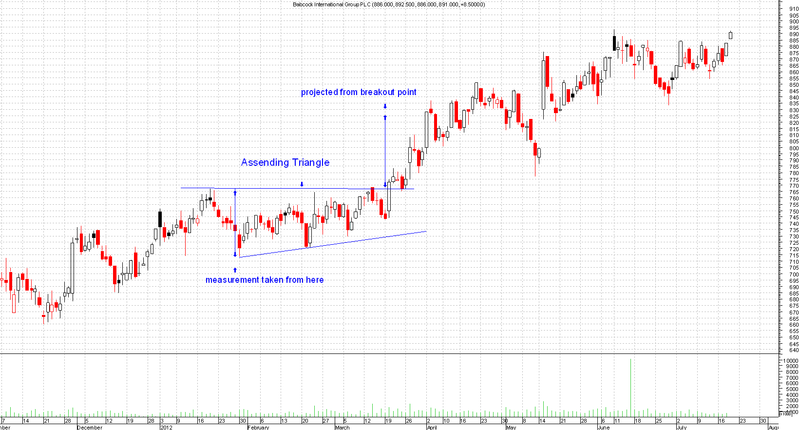 Ascending triangles are bullish and implies a break higher. This should breakout in the direction of the previous trend. Volume should be higher on the breakout and once a breakout occurs then that level where it broke out from will now be support. For the target use the widest point of the triangle as a measuring tool. If for example at the widest point it was 50 pips long then the target is going to be 50 pips from the breakout point. Note: Triangles can take from 1 month to 3 months to form and any smaller than 2 weeks could be a pennant or flag formation.